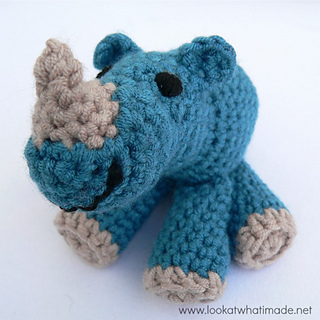 Rupert the Baby Rhino is an Intermediate level pattern with tons of photos (and I do mean tons!). His ears, legs and body are join-as-you-go, meaning that there is minimal sewing involved in the project. Using the hook and yarn suggested in the pattern, Rupert will fit in your hand with ease. His limbs are movable, so he can sit, stand and lie down. This pattern is the first in a row of collaborations between Anette Bak and myself. We are hoping to have a whole zoo (and farm) before the year is out. Rupert also has two cousins: Napolion the baby lion and Meimei the baby elephant. 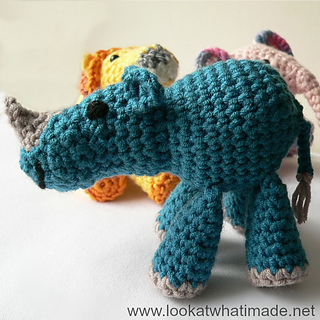 On top of that I also have patterns for a lion lovie and an elephant comfort blanket. Happy hooking and please do not hesitate to contact me if anything is unclear!